A first-person account of an encounter with the progressive campus mob. Editor’s Note: The following piece first appeared on Josh Blackman’s blog. It is adapted and reprinted here with permission. 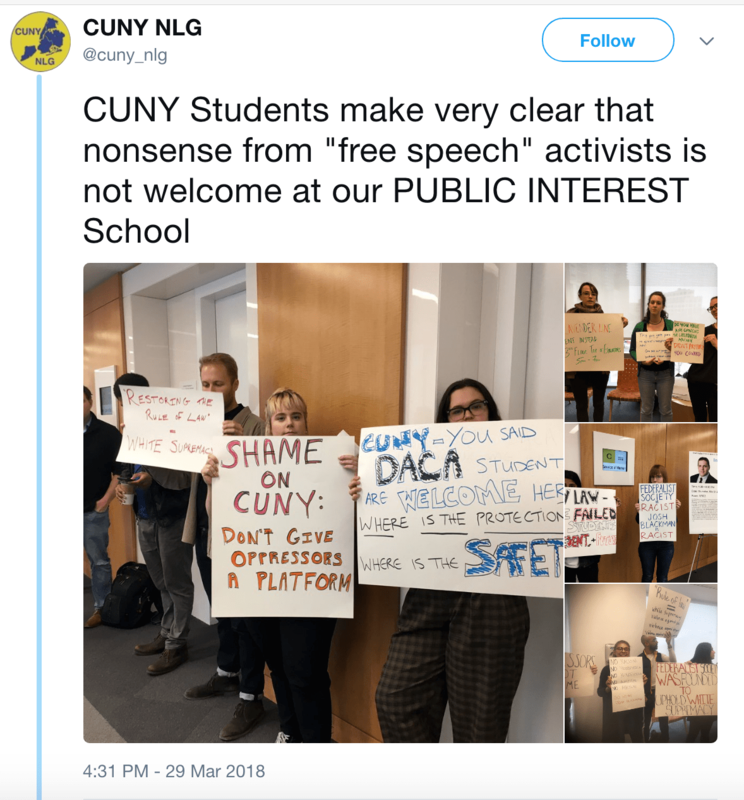 On Thursday, March 29, students at the City University of New York School of Law protested and heckled my lecture about free speech on campus. You can watch video of the entire event, which lasted about 70 minutes, below. The protest and heckling took place during the first eight minutes of the recording. In this post, I will recount the events that led up to the protest, and describe my experiences during the encounter. In future writings, I will provide my own commentary. Here, I will try to lay out the facts to the best of my recollection, aided by the (sometimes) inaudible recording. 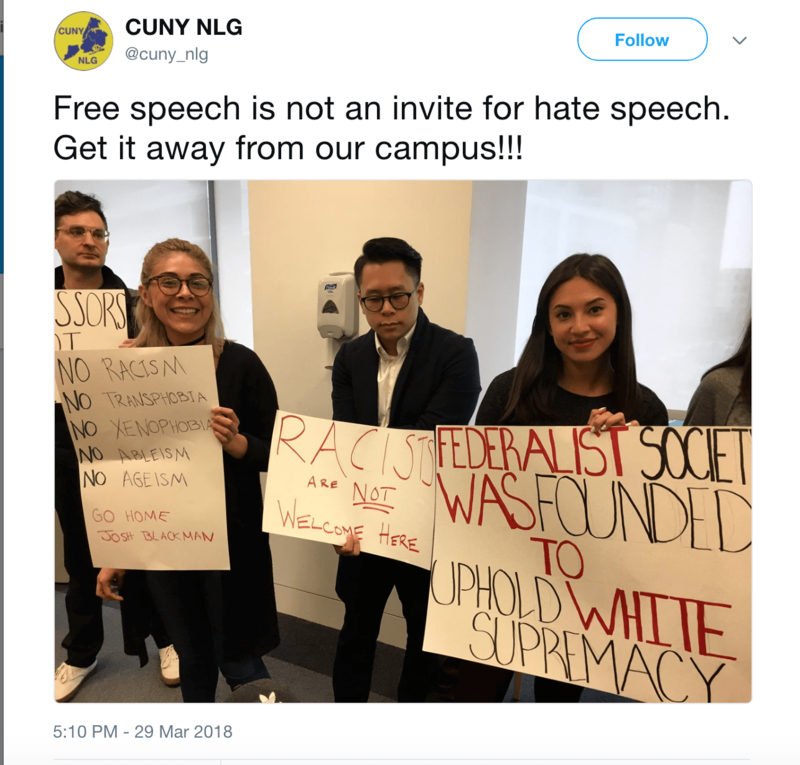 These students saw first, that this is a Federalist Society event; and second, they saw a few of your writings (specifically a National Review article praising Sessions for rescinding DACA and ACA), and instantly assume you’re racist; and third, our event being titled about free speech is reminiscent of events that claim free speech just to invite people like Milo Yiannopoulos and Ann Coulter. He explained that “we have the support of the administration” and the event would proceed as scheduled. 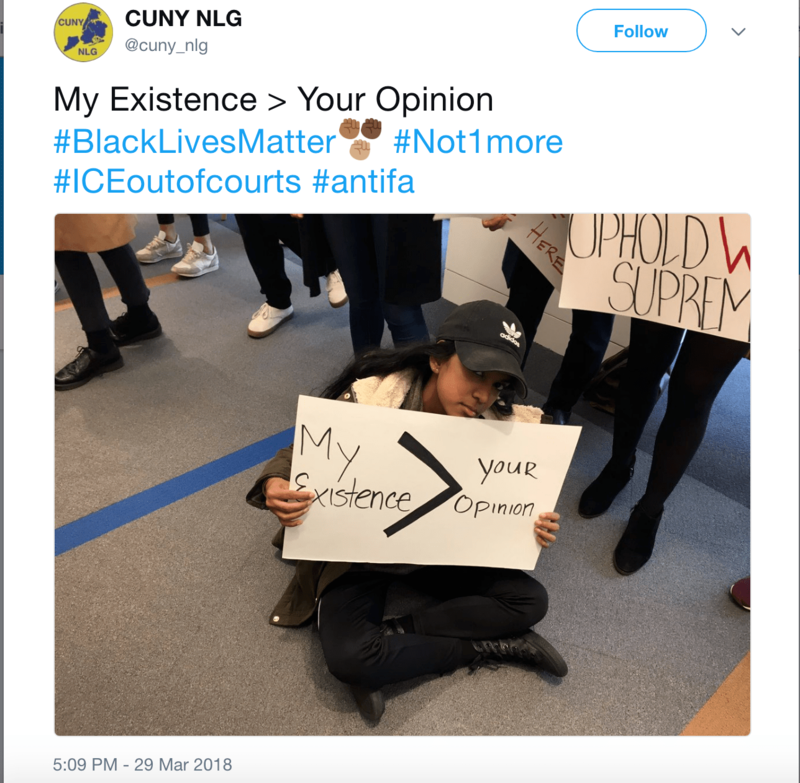 As a law school, a public institution, and a school within the CUNY system, we are committed to academic freedom, the free exchange of ideas, and expression of all points of view, including the freedom to disagree with the viewpoints of others. University policy provides guidelines for how to express disagreement lawfully (including through demonstrations), defines prohibited conduct, and details the procedure for handling disruptive demonstrations at CUNY facilities. Many of us witnessed a demonstration here earlier this year, which is an example of expressive conduct that does not run afoul of any University policy. We attach a copy of the University’s policies and rules, including those covering the processes for dealing with student and employee prohibited conduct. She attached CUNY’s Policy on Freedom of Expression and Expressive Conduct. Shortly before the event began, I spoke with CUNY’s chief of public safety. He explained that a few dozen students were already assembled in the hallway outside the room. They had amassed earlier in the day to create posters and signs. (Students passed out poster board and markers.) I asked him if they would heckle me in order to prevent me from speaking. He said he did not know. Then he asked me what my “exit plan” was. He explained that there were certain safe ways to exit the building. When I said I planned to leave via Uber, and not the subway, he was relieved. It was a question I had never before considered. Although he initially told me he did not want to be present in the room, he escorted me from the elevator to the classroom. The video, which is posted above, illustrates the scene as I entered the classroom. Several dozen students (I will leave the count to others) held up signs and chanted “Shame on you,” booed, and hissed. Several students even posted photographs of these signs to social media. One student made a halfhearted effort to block my entry into the room with his backpack, but I easily moved past him. Much to my surprise, when I entered the room after that rude welcome, there were only about five people in attendance. Moments later, the protesters with signs filed in and surrounded all four sides of the room. About a dozen of them were standing directly behind me. As the president began my introduction, the protesters heckled him: “This is not okay.” As he said my name, someone called out, “He’s a white supremacist.” Others booed: “I don’t understand how CUNY law allows this.” One of the protesters observed, “He’s filming us. Just so everyone is aware, he is filming us.” I told her, “I am.” (New York is a one-party-consent-recording jurisdiction. All right, listen. Everybody stop. Let me tell you something. The university rules are people get to speak. You may protest. You may protest. But you may not keep anyone from speaking. If you do, I have other things to do, I will be back. Or you can resolve this yourselves. Or you can have me resolve it. Professor Franklin Siegel, who was seated in the back, urged the students, “Please don’t take the bait.” A student muttered, “Franklin, come on.” He repeated, “Don’t take the bait.” A student said, “He is threatening us.” The students then discussed among themselves that it was within the administration’s discretion to punish them. A student shouted out “F*** the law.” This comment stunned me. I replied, “F*** the law? That’s a very odd thing. You are all in law school. And it is a bizarre thing to say f*** the law when you are in law school.” They all started to yell and shout over me. One student yelled at me, “You chose CUNY, didn’t you? You knew what would happen.” At the time, I didn’t appreciate the significance of her question. The students apparently believed I picked CUNY because I wanted to be protested. This was the meaning of the “Don’t take the bait” comment. To the contrary! I had never been protested before. I was shocked that a lecture about free speech would occasion such a protest. Yet, once I found out they were going to protest me, I was not going to back down and withdraw. The hecklers at this public institution would not veto my speech. I would stand there as long as needed to make my point. A student shouted, “CUNY Law is not acting right.” I continued, “I’ll do the same. I’m going to express my views. Let me go down this check list. I think DACA . . .” I started to make a comment about DACA, when the student standing immediately to my right said, “I don’t want to hear this.” Then they started to exit. I said, “You want to go? Please leave, by all means.” They began to exit. I said, “I think DACA is a good policy.” A student replied, “I think you’re tired.” I admitted, in full candor, “No, I’m feeling pretty good.” At that point, the speakers realized that the heckler’s veto had failed and that I was going to speak. A student shouted, “You’re lying to yourself.” Another said, “You’re a white supremacist.” “This is really about CUNY Law and how you let this happen.” Another said “Shame on you” to the students in attendance. Indeed, though there were only five people at the start of the event, by the time it concluded I counted about 30. I learned that some students were either ashamed or intimidated and did not want to be seen attending the event. A number of students thanked me after the event, and explained that conservative speech is stifled on campus not by the faculty but by the students. The students swarm on anyone who does not toe the progressive line. Less than 24 hours before the protest, the South Texas College of Law Houston granted me tenure. I am deeply grateful to my colleagues for their vote of confidence. This security will ensure that I can effectively engage protesters and challenge their ideas for many decades to come.